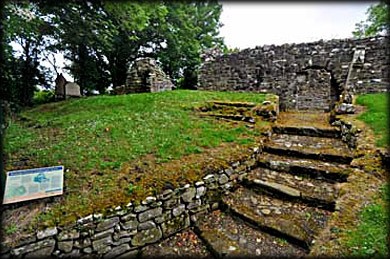 The old church at Bovevagh is situated on a promontory above the Bovevagh River. The name is derived from "Both Maeve" meaning "The Church of Maeve". 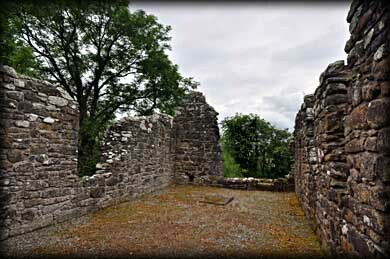 The earliest reference to a church being here was recorded in 1100 AD when a wooden church was burned. The medieval church we see today was in use over a long period. The east window is possibly 13th century and the west window could be as late as the 18th century. 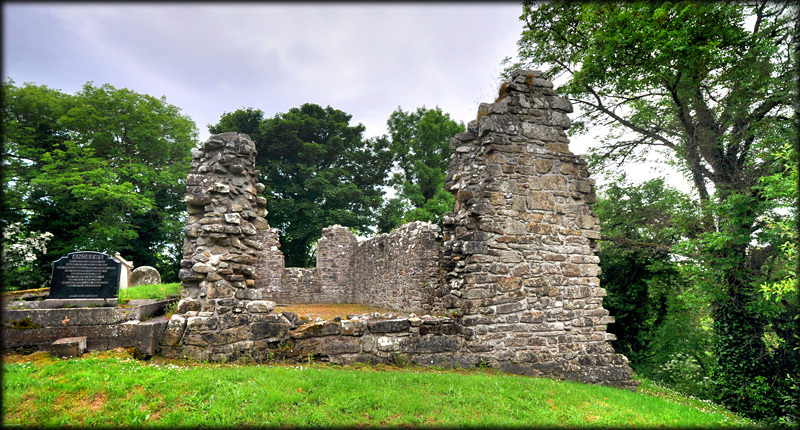 The site is generally associated with St Ringan but connections with Saints Patrick, Aidan and Adamnan have also been suggested. The mortuary house was the main reason I called up to Bovevagh. It is situated just 10 miles north of the superb example at Banagher and well worth viewing. This possible 12th century tomb shrine is built from rubble and has a stone-flagged roof. Internally there is a body shaped cavity with the head at the east end. A small hole in the east gable, pictured below, would have allowed pilgrims to reach in and touch the head/relics of the saint. 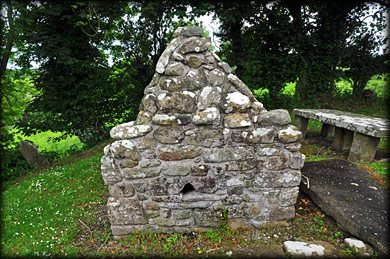 Locally it is believed the mortuary house is the tomb shrine of St Ringan. 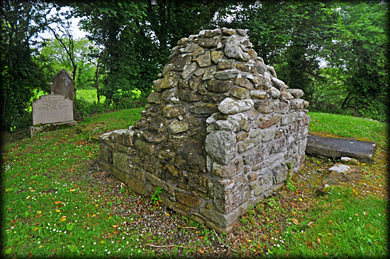 There are various types of tomb shrines located throughout Ireland, including the oratory type at Temple Ciarán,Clonmacnoise, and the tent shaped shrines at Temple Cronan and Killoluaig. Situated: From Dungiven head north on Drumlane Rd. Then after 2.7 miles turn left onto Bovevagh Rd. The site is hidden in the trees 0.9 miles down here on your right. Discoverer Map 7: C 6671 1401. Last visit June 2013.